Evolution Ability Enhance [Poisonous Beauty]: Swiftly shoots a flurry of feathers at all enemies, inflicting 2 layers of Poisonous Feathers on them. The enemy takes indirect damage equal to 1/3/6/10/15% (based on the layers of Poisonous Feathers he/she has) of his/her max HP at the beginning of his/her turn, to a maximum of 280% of Chin’s ATK. Poisonous Feathers stack up to 5 layers and are reduced by 1 layer when the target takes poison damage. Upon Evolving, the attacker receives 1 layer of Poisonous Feather when Chin receives damage. Chin’s characteristic is to act fast and often. Therefore, we’ll explore the Souls that will give her more opportunities to act. Soultaker – There should not be any surprise that Soultaker is the first one that comes to mind. Being able to act often means she can stack Poison Feathers much quicker to start doing serious damage. In addition, Soultaker can help shake off control effects. Scarlet – Scarlet is another good way to stack Poison Feather to the enemies using normal attacks. With the help of Shouzu, Chin should be able to stack full Poison Feather in no time. Mirror Lady is more of an ambush to enemies. While this Soul does not stack Poison Feather as quickly as the previous two. It’s effective to potentially take out strong single target DPSs that are targeting Chin, namely Arakawa Lord. Seductress is another good option for Chin to take advantage of her multi-hit attack. This would somewhat compensate the low DOT output. In terms of stats, I would say SPD is the most important. Chin needs to act fast to build up her poison damage. ATK is important since her damage is directly related to her max ATK. Effect RES is pretty essential in higher level PvP. HP is less desirable if it means you’ll have to sacrifice ATK but sometimes Chin may need to have enough survivability to drag the fight on against turtle teams. Crit helps with DOT damage but the final damage is capped by Chin’s ATK. Description Chin swiftly shoots a feather at an enemy, dealing damage equal to 80% of her ATK and inflicting 2 layers of Poisonous Feathers on them. Has a 100% (+ Effect HIT) chance of inflicting a layer of Poison (grade equal to the current Poisonous Feathers layers; reduces target’s SPD by 10% and ignores target’s DEF when resolving indirect damage by 10 x Poison grade) on them for 2 turns. Description Swiftly shoots a flurry of feathers at all enemies, inflicting 2 layers of Poisonous Feathers on them. The enemy takes indirect damage equal to 1/3/6/10/15% (based on the layers of Poisonous Feathers he/she has) of his/her max HP at the beginning of his/her turn, to a maximum of 280% of Chin’s ATK. Poisonous Feathers stack up to 5 layers and are reduced by 1 layer when the target takes poison damage. Upon Evolving, the attacker receives 1 layer of Poisonous Feather when Chin receives damage. Level up Lv.2: Increase indirect damage from Poisonous Feathers by 50%. Lv.5 Any enemy with 5 layers of Poisonous Feathers takes damage equal to 30% of its max HP immediately when inflicted with Poisonous Feathers, to a maximum of 280% of Chin’s ATK. The key is Kamaitachi need to be fast to get the first action. This is a different setup than Fire Rain. Fire Rain has a bigger margin of error. Chin also need to be fast to build up Poison. The key is to have Kamaitachi keep pulling and Chin keep poisoning enemies. Houoga and Hannya are there to keep enemies from doing anything damaging. With high enough Effect HIT and being able to land the first hit, the enemies should ideally just sit there and not able to do anything. Realistically, though, this team has a high orb consumption and very control reliant so there is risk if the fight drags on for too long. With such a high consumption, there is a risk of running out of orbs even with Oitsuki and Fortune Cats especially when the enemy has Tree Nymph. This is requires the players to make good decision in the fight. You may not want Hououga and Hannya to use special attack every time, sometimes you need to pick and choose whom to control. This is the difference between high level and low level Duel. 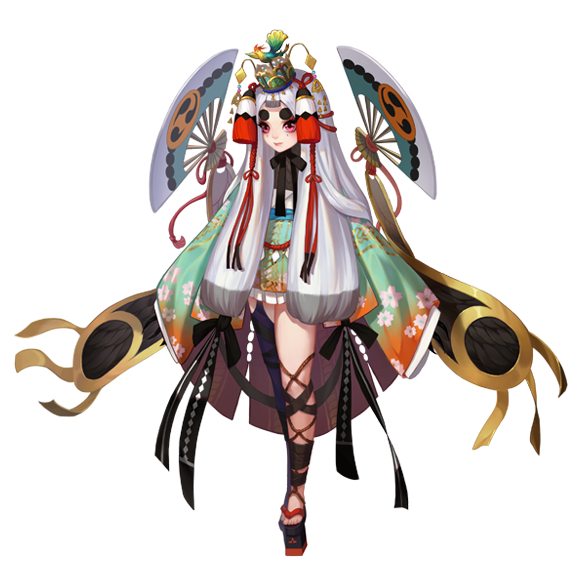 Hououga should prioritize her control for DPS and Healer/Seimei, while Hannya should prioritize his seal for DPS and Tree Nymph/Senecio. Alternatively, Chin can be used in turtle teams and drag the fight out. In this case, Chin is a key DPS and Scarlet will be useful here with Shouzu. Ame Onna and Ebisu are there to ensure survivability and action. Maestro is an important Shikigami to speed up teammates as well as letting Chin unleash her special attack to take out enemies when the time is right. Chin is seen as a counter to defensive teams. Her DOT damage effectively puts pressure on the enemies’ HP count and keeps the healers busy. The only thing is that her damage is actually subject to enemy’s DEF so in many cases, she does not deliver as much damage as you expected. Before the recent update, Chin was considered the queen of DOT since her poison damage was absolute and multiple-Chin teams are a thing. To use her in Soul stages, I would make her the secondary DPS since she won’t be able to build up Poison Feathers in time. In Sougenbi, however, I think she’ll be better since the fight is much longer. If I remembered correctly, Sougenbi and other Bosses can be attached Poison Feather. Similar to Soul, if you want to use her, you’ll need a main DPS. Chin’s DOT damage is being capped by her ATK so that limits her damage output. Most Bosses are single targets and are not very fast. Therefore DOT is not as effective. She’s probably more useful in Secret Zones though. Shiro Mujou – Shiro Mujou is probably the first DOT Shikigamis players get to know. He can actually do quite a bit of damage with his Poison. In addition, his Poison not dispellable if I remember correctly. He can also summon ghosts that would take the place of fallen enemies which is a huge counter for revival teams. Chin doesn’t have that luxury. Rather, she is more aggressive in an attacking role. This makes the lack of damage her biggest weakness. Afterall, who needs an attacker that can’t do damage. Kiyohime – Another DOT that is seldom used. Kiyohime does not stand out, unlike Shiro Mujou or Chin. While these DOT Shikigamis have similar functionalities: they either do damage over time themselves or they support Hououka, Kiyohime is usually not the first choice due to her low stats. Another reason these poison type shikigamis are not overly popular is because of the prominence of Ame Onna. Chin used to be popular in PvP because her poison damage ignores DEF. Of course, she would be released with her current skill set which decreased her damage significantly. While there are still ways to use her, Chin is no longer special and that caused a lot of disappointment. The good news is that she may get skill adjustment soon. In the testing server, her Poison Beauty has significantly more DOT damage but there is not much change to the other two skills. Poison Erosion would remain rarely used. We would need to see if she’ll come to Global with her new Poison Beauty. If that’s the case, she’ll once again be the Queen of Poison. Aug 2018 rebalance: Chin is now raised again as the top Poison damage dealer with double the indirect damage as before. Still I suggest multiple Chins to stack Poison Feather faster. Chin is a damage-over-time unit so she takes time to build up her damage. Therefore, it would take too long for her carry fodders. Her damage comes from debuff effects, which most Bosses are immuned. There is one that she can be used and that is Totems. I’ve seen multiple Chins take down a Level 3 Totem by taking advantage of her ability to damage the boss according to its max HP. Of course, you’ll need several fully maxed Chins so that is not for everybody. Still, this is one area which she can contribute. Poison Erosion is an AOE skill so she can fill the role as one of the DPSs. Though, Chin is not the number one choice since AI prioritizes Poison Beauty in order to stack Poison Feathers. This makes her a bad choice for auto runs. With the latest skill adjustment, she is once again our favourite Queen of Poison. If you are interested in DOT play style, she’ll be your prime choice as the best poison user in the game. One of the popular Chin teams uses multiple Chins to stack Poison fast. With that many poison layers, Ame Onna will just stand there not able to do anything.